Third generation Bay Area painter Kim Frohsin works in a variety of media, including painting, drawing, mono-prints, mixed media and collage. Her latest series “Dancers & Athletes” provides viewers with samples dating from late summer 2017 until late February 2018. 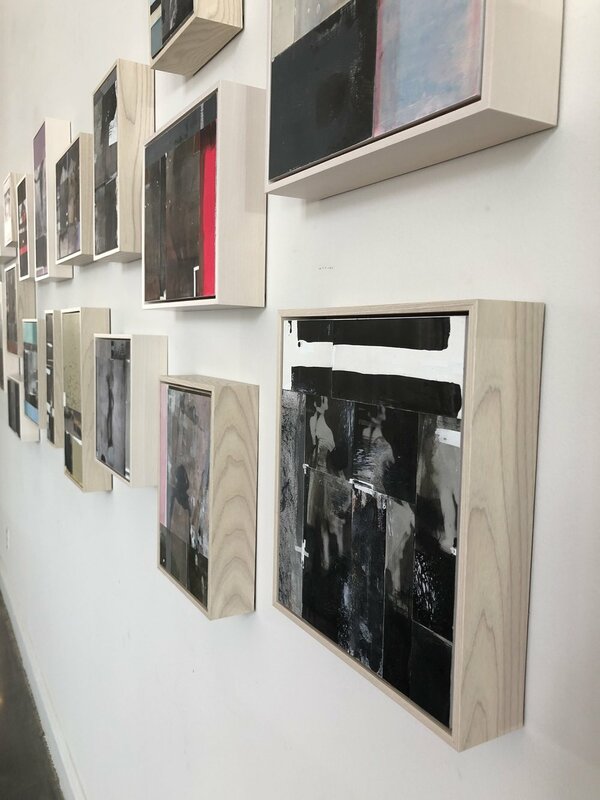 The earliest works are mostly monochromatic, while the 2018 works provide more colorful, collaged insertions and complex, puzzle-like designs. We find a singular passion and core inspiration for the pieces: dancers and athletes, portrayed in numerous states of stilled activity, performance and motion. The assemblages are raw and unpolished, yet simultaneously sophisticated in abstracted, ethereal and fragmented ways. Each work conveys a highly personal yet universal narrative. All framed artwork is for sale and available for viewing any time during our regular showroom hours. Kim has worked with City Picture Frame for many years to formulate the ideal frame design for her works, hand-selecting a mixture of ash and maple wood frames, white washed to subtle perfection. The deep floater frames elegantly compliment her pieces with a sleek profile and a satisfying prominence.